Concrete mileage post painted white with distances to Kempsey (K) 19 miles and Taree (T) 57 miles impressed into the concrete and painted black. The post is an irregular shape, forming a 'v' at front and an inverted 'v' at back. 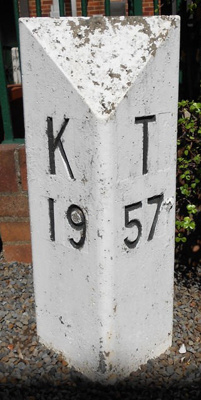 The post was possibly situated on the Pacific Highway at Telegraph Point, near Port Macquarie. Used by the Department of Main Roads NSW prior to conversion to metric measurement in July 1974.